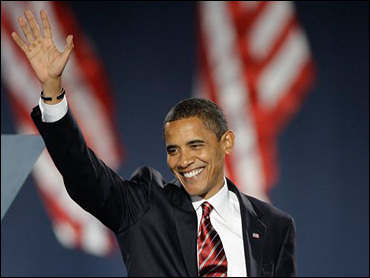 In an extraordinary moment in America's history, Democratic presidential nominee Barack Obama has won the 2008 presidential election and will become the 44th president of the United States and the country's first African-American leader. "Because of what we did on this day, in this election, in this defining moment, change has come to America," Obama told 125,000 supporters gathered in Chicago's Grant Park to celebrate his victory. "If there is anyone out there who still doubts that America is a place where all things are possible, who still wonders if the dream of our founders is alive in our time, who still questions the power of our democracy, tonight is your answer," he added. "A new dawn of American leadership is at hand," Obama said. Obama's victory comes on the strength of projected wins in battleground states that went to President George W. Bush four years ago - Ohio, Florida, Virginia, Indiana, New Mexico, Colorado, Nevada and Iowa - as well as a victory in Pennsylvania, a state that John McCain had hoped to turn blue to buoy his bid for an upset victory. As the results came in Tuesday evening, a senior aide told CBS News the McCain camp was hoping for a "miracle," but the Arizona senator was not able to defy expectations in one of the worst election years for Republicans in decades. "We have come to the end of a long journey," McCain said in a concession speech late Tuesday night. "The American people have spoken, and they have spoken clearly." "Let there be no reason now for any American not to cherish their citizenship in this, the greatest nation on earth," he added, lauding the historic nature of Obama's victory for African-Americans. Both McCain and President George W. Bush called Obama Tuesday evening to congratulate him on his victory, the Obama campaign said. The president also called McCain, the White House said, telling the Republican nominee, "John, you gave it your all." Obama's victory "is in so many ways a complete repudiation of everything about the presidency of George W. Bush," writes CBSNews.com senior political editor Vaughn Ververs. Hillary Clinton, the New York senator whom Obama defeated in a tough Democratic primary battle, released a statement saying that she will do "all that I can" to support Obama and Joe Biden, the vice president elect, "in the difficult work that lies ahead." She said that under their leadership, as well as that of a Democratic Congress, "we will chart a better course to build a new economy and rebuild our leadership in the world." "Obama's ability to retain an overwhelming majority of Clinton support was a key factor in his victory over McCain," writes CBSNews.com political analyst Samuel J. Best. Democrats increased their majorities in both chambers of Congress on Tuesday, assuring that their party will control Congress and the White House just two years after the Republican Party controlled both. "The road ahead will be long," Obama said in his remarks. "Our climb will be steep. We may not get there in one year or even one term, but America - I have never been more hopeful than I am tonight that we will get there. I promise you - we as a people will get there." In addition to the above states, CBS News estimates that Obama will win California, New York, Washington, Michigan, Oregon, Minnesota, Wisconsin, Vermont, Illinois, New Jersey, New Hampshire, Massachusetts, Maryland, Hawaii, Connecticut, Maine, Delaware, Rhode Island and the District of Columbia. McCain will take Texas, Arizona, Kentucky, Georgia, South Carolina, Louisiana, Mississippi, Utah, West Virginia, South Dakota, Arkansas, Alabama, Idaho, Tennessee, Kansas, Montana, North Dakota, Wyoming, Alaska and Oklahoma, the network projects. Obama is now estimated to take at least 349 electoral votes, while McCain has 163. 270 electoral votes are needed to take the White House. CBS News has not yet projected winners in North Carolina or Missouri. For full election results, click here. Exit polls suggested women helped propel Obama to victory, backing the Democratic nominee 56 percent to 43 percent. Obama also held a slight edge among men. Hispanics backed Obama over McCain by a margin of 66 percent to 31 percent, helping him take the Western states of Colorado, New Mexico, and Nevada. Young voters between 18 and 29 - 18 percent of the electorate - favored Obama 66 percent to 31 percent. Independents also backed Obama, by a small margin. Exit polls showed widespread pessimism about the economy and the country's leadership. Three in four voters say the U.S. is on the wrong track, while voters gave high disapproval ratings to both President Bush (72 percent) and Congress (73 percent). Voters overwhelmingly cited the struggling economy as the most important issue in their decision. Obama's win came "on the basis of deep voter concerns about the state of the economy and strong disapproval of President Bush," writes CBS News political consultant Stanley Feldman. Long lines were commonplace across the country Tuesday as people waited to cast ballots, with waits of up to six-and-a-half hours in Missouri and four hours in Manhattan. But many voters persevered despite the long waits, and elections officials predicted record turnout nationwide. "This is our moment," Obama concluded in his victory remarks. "This is our time to put our people back to work and open doors of opportunity for our kids, to restore prosperity and promote the cause of peace, to reclaim the American Dream." His election, he said, was an opportunity to reaffirm "that out of many, we are one, that while we breathe, we hope, and where we are met with cynicism, and doubt, and those who tell us that we can't, we will respond with that timeless creed that sums up the spirit of a people: Yes we can."